In November 2016, Microsoft became a platinum member of the Linux Foundation, the primary sponsor of top-drawer Linux talent (including Linus), as well as a leading organizer of Linux conferences and source of Linux news. Does it matter that Microsoft has a long history of fighting Linux with patent claims? Seems it should. Run a Google search for "microsoft linux patents", and you'll get almost a half-million results, most of which raise questions. Is Microsoft now ready to settle or drop claims? Is this about keeping your friends close and your enemies closer? Is it just a seat at a table it can't hurt Microsoft to sit at? Maybe it will help to look at patents in general, rather than any of the ones you'll find in contention (or potential contention) at that last link. Stable ownership is the gift of social law, and is given late in the progress of society. It would be curious then, if an idea, the fugitive fermentation of an individual brain, could, of natural right, be claimed in exclusive and stable property. If nature has made any one thing less susceptible than all others of exclusive property, it is the action of the thinking power called an idea, which an individual may exclusively possess as long as he keeps it to himself; but the moment it is divulged, it forces itself into the possession of every one, and the receiver cannot dispossess himself of it. Its peculiar character, too, is that no one possesses the less, because every other possesses the whole of it. He who receives an idea from me, receives instruction himself without lessening mine; as he who lights his taper at mine, receives light without darkening me. That ideas should freely spread from one to another over the globe, for the moral and mutual instruction of man, and improvement of his condition, seems to have been peculiarly and benevolently designed by nature, when she made them, like fire, expansible over all space, without lessening their density in any point, and like the air in which we breathe, move, and have our physical being, incapable of confinement or exclusive appropriation. Inventions then cannot, in nature, be a subject of property. Society may give an exclusive right to the profits arising from them, as an encouragement to men to pursue ideas which may produce utility, but this may or may not be done, according to the will and convenience of the society, without claim or complaint from anybody. That may be the first solid case for both free software and open source. Yet it would be a mistake to hold Jefferson, himself an inventor, to that single statement, since his positions on patents and attitudes toward them changed over the years. PATENTS: If people had understood how patents would be granted when most of today's ideas were invented, and had taken out patents, the industry would be at a complete standstill today. I feel certain that some large company will patent some obvious thing related to interface, object orientation, algorithm, application extension or other crucial technique. If we assume this company has no need of any of our patents then [they] have a 17-year right to take as much of our profits as they want. The solution to this is patent exchanges with large companies and patenting as much as we can. Microsoft and its employees have worked hard to build and maintain a world-class patent portfolio, which now includes more than 59,000 US and international patents, and over 36,000 pending patent applications. Drafting and prosecuting high-quality patent applications is key to that success. Our patenting strategy, in terms of how, when and where we choose to protect those innovations, is closely aligned to Microsoft's overall business strategy. Microsoft is committed to transparency of patent ownership and all patents owned directly by either Microsoft or MTL or through subsidiaries are publicly available via the Open Register of Patent Ownership. Microsoft will continue to be one of the top patent filers in the world, which reflects our commitment to the tremendous amount of R&D and innovation that goes into creating products for our partners and our customers. A friend at Microsoft many years ago explained to me that the main reason for a large company to hold a patent portfolio was not to license or cross-license, but instead to participate in what he called "nuclear arms dealing", most of which consists of "trades": private agreements that open business opportunities unimpeded by patent-based threats. Kind of like, "I'll let you work on my land if you let me work on yours." There are also moves that don't involve any second parties. The first party simply opens market opportunities by telling the world that a patented invention is free for the taking. Perhaps the best example of that is Ethernet, which won in the market over IBM's Token Ring and General Motor's Token Bus, because Ethernet's patent holders—Xerox, Digital Equipment Corp. and Intel (nicknamed "DIX")—declared Ethernet an open standard. This was at the urging of Bob Metcalfe, Ethernet's primary inventor, an inveterate critic of open source whose own mind changed over the years. 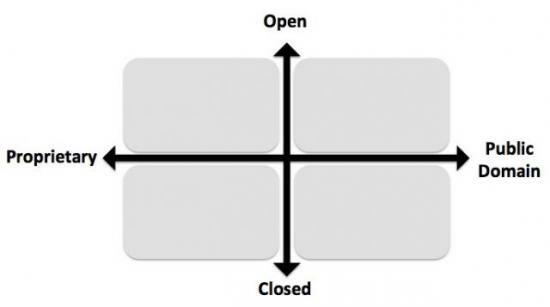 To put patents in perspective, Figure 1 shows the Burton Matrix, which Craig Burton created originally to make clear that the opposite of open was not proprietary, but closed. And that the opposite of proprietary was public domain. Patents that aren't encumbered by property rights threats would go in the lower-right quadrant, while Linux and other forms of open-source code would go in the upper-right. Could it be that Microsoft would like to follow DIX's Ethernet move by pushing some of its patents in a rightward direction here? I guess we'll see. Meanwhile, it should help to be mindful of where patents, and their corporate parents, dwell in civilization. 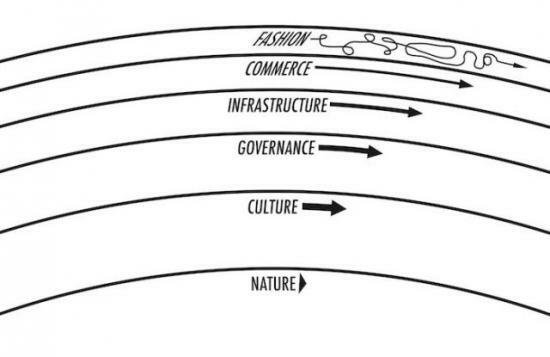 To help with that, let's borrow The Long Now's "Layers of Time" graphic (Figure 2). Figure 2. The Long Now's "Layers of Time"
At the bottom we find the end-to-end nature of the Net. It's also where we find Richard M. Stallman, the GNU project, the Free Software Foundation (FSF) and hackers whose interests are anchored in the nature of software, which they understand fundamentally to be free. When Richard M. Stallman writes "everyone will be able to obtain good system software free, just like air", he's operating at the Nature level. He doesn't just believe software ought to be free; he believes its nature is to be free. The unbending constancy of his beliefs has anchored free software, and then open source development, since the 1980s. That's when the GNU tools and components, along with the Internet, began to grow and flourish. The open source movement, which grew on top of the free software movement, is most at home one layer up, in Culture. Since Culture supports the Governance, the open source community devotes a lot of energy and thought to the subject of licensing. In fact, the Open Source Initiative (OSI) serves a kind of governance function, carefully approving open source licenses that fit its definition of open source. While Richard and the FSF, sitting down there at the Nature level, strongly advocate one license (the GPL or General Public License), the OSI has approved around 50 of them. Many of those licenses are authored by commercial entities with an interest in the governance that supports the infrastructure they put to use. Not coincidentally, the Culture on which this new world depends is hacker culture, about which Eric, a founder of the OSI, has written extensively (he edited both editions of The Hacker's Dictionary). Both he and Bruce Perens, another leading open source figure, have purposefully advocated open source to business for many years. And although open source hackers tend to be more interested in business than free software hackers, both want Governance and Infrastructure that support business but are not determined by business—except when business works with the hacker community. Hence OSI's license-approval process. While the number of open source licenses has been a source of some debate (almost everybody would rather see fewer licenses), it is important to note that the relationship between these layers is not the issue. The last thing anybody in the free software or open source movements wants is for anybody at the Commerce level to reach down into Governance to control or restrict Infrastructure that everybody relies upon. Even though that's exactly why large companies, and whole industries, hire lobbyists. More about that issue shortly. Changing corporate culture to adapt to open source development methods is not easy. Dan Frye, who runs IBM's Linux development program, recently told me that IBM has worked hard to make its internal development efforts coordinate smoothly with Linux's. That way, when IBM "scratches its itches", the kernel patches that result have a high likelihood of acceptance. IBM has faith that its accepted patches are ones that are most likely to work for everybody and not just for IBM. This is a natural and positive way for infrastructure to grow. And grow it has. The selection of commodity open source building materials is now so complete that most businesses have no choice but to use those components—or, in many cases, to recognize that IT personnel in their enterprises have been building their own open source "solutions" for some time. That realization can come as a shock. Open source infrastructure inside companies often (perhaps usually—it's hard to tell) gets built without IT brass knowing about it. In many cases, internal open source development and use has had conditional approval by CIOs and CTOs. Whatever the course of open source growth, at a certain point a threshold is crossed, and companies suddenly know that open source is no longer the exception, but the rule. Now we find ourselves living in a time of extreme dependence on the commerce layer, living like serfs in the feudal castles of Google, Apple, Facebook and Amazon: a combined entity commonly called GAFA in Europe. Microsoft wouldn't mind having an M in that acronym, I suppose. Is that what joining the Linux Foundation is about? Today the reality of Linux is of a piece with the reality of the Internet. Neither is going away. Both are co-evolving in the minds of every geek adding value to them. Both transcend the interests of every company contributing to them, including Google. If Satya Nadella looks at reality with the same clear eyes Bill Gates cast on the Internet in 1995, he might see the wisdom of embracing Linux with the same enthusiasm and commitment. What could Microsoft and the Linux Foundation do? The Linux Foundation should include in its membership agreement a good-faith commitment not to initiate any patent litigation relating to the Linux platform against anyone and exclude those who break it. A trade association should not permit its members to fight among themselves. Microsoft should declare that no part of the company will in future initiate software patent claims against the Linux platform and as a sign of its good faith join the Open Invention Network. That's not of itself magical—Oracle and Google are both OIN members and still litigating Android patents—but the combination of gestures could make a tremendous difference to community trust.